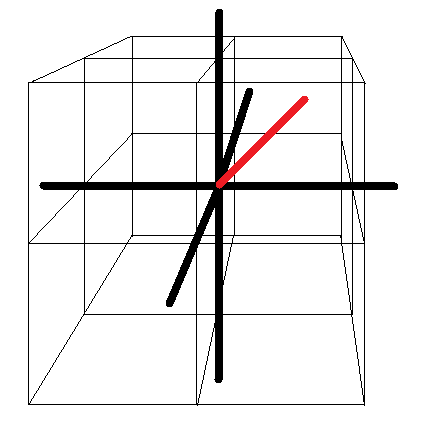 A vector in a three-dimensional space. I envision the emotional or spiritual world as a ten-dimensional space, in which a vector (arrow) beginning at the origin (the center of the space) depicts a person’s emotional state at any point in time. The vector’s length indicates the intensity of one’s emotions at a given moment, while its direction indicates what kinds of feelings those are — equal parts joy and sadness, for example, or some anger and much love. These are the energies one is emanating at that moment, the kinds of light or darkness one creates.